The 5. Bayreuth-Frankfurt-Leidener Kolloquium zur Berberologie took place at the University of Leiden / the Netherlands from 8–11 October 2008. The focus of attention was on the dialectal variation of the Berber languages. The contributions dealt, amongst others, with morphological as well as syntactical aspects, proverbs and topicalisation of various Berber languages. Berber linguistics is a relatively recent, but fast growing field, although scholars from outside francophone countries still give little attention to this area of research. The “Berber Studies” series which is irregularly published since 2001 is an excellent confirmation of the emerging body of scholarship that also includes Berber languages‘ native speakers. 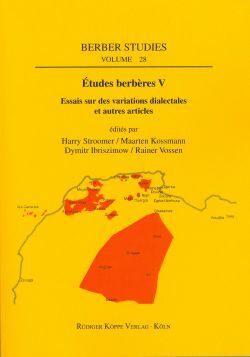 Volume 28 [...] is dealing with the stereotype of Berber languages seen as one Berber language and brings fresh view on Berber linguistics. [...] As a whole, the volume can be considered as a very valuable review of the main domains of Berber linguistics and as a presentation of some pioneer aspects in this field. It can serve as an useful handbook and source material for linguistic research.